Wakeboarder :: Thoughts about creating wrap around seating?? Thoughts about creating wrap around seating?? Posted: May 06, 2009 8:54 am Post subject: Thoughts about creating wrap around seating?? 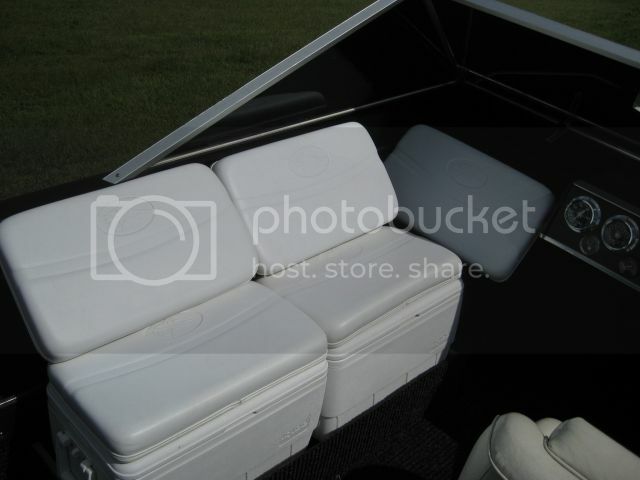 Ok, I wish when I bought the boat it came with wrap around seating instead of 2 captains chairs. I am looking at trying to create wrap around seating since it would be alot more helpful and provide more "sealed" room. I would lose some room I understand, but I want to be able to lift the seats and hide 2 85lb bags under that side as well as storing ropes, lights, etc. I am at work and dont have access to photoshop so I was hoping somebody could shop what it would look like with wrap around seating. I have it in my head but wanted to know some people's thoughts, some things I didn't think of, and some ideas on cost if people have done something like this. Wish I could move to a boat that already has it but im stuck with this one for a while, so im making it how I want it. EQ would of course move so thats not a biggie. I figured I could make the box frames for the seat, just more of getting it upholstered I think and then determining if I want hinges or just take off the seats, etc. How much work would a network work if a network could network? Are you taking the added weight into account? I realize that is not a bad thing when riding, but what about what it might do to the boat's performance when not riding? Especially since you're putting it near the stern- extra weight in the stern is going to affect your ability to get on plane whether you are riding or not riding. Got enough HP to handle it? If you're rockin a 3.0L, I'd guess you don't. 4.3L might be a different story. thanks for responding back. I have thought about the weight that it will off set the boats performance. I don't know how much weight will really be on the back end rather than middle of the boat. When riding we usually run the 2 85lb bags in the rear, a 700 in the locker, a 350 in middle rear and a 350 up front....maybe we wouldnt have to fill as much in the bags to counter that. I dont think i'd be putting too much to the stern since im keeping the existing seats in the back and going forward to front from there....Thoughts? I agree with the part about looking for a larger boat....unfortunately, I'm with this one for a while since I owe about 2k more than its worth and I dont have the ability to do much right now until my truck is paid for (6 months and then i triple pay on boat). I really don't have a problem being stuck with it as we have finally dialed it in like it need to be, but I just would like the wrap around seating option. If I can get the fabric, I can buy the cushion as well and almost fabricate it all. I didn't realize Tahoe will sell out the fabric. Since that option is available, I can probably get a sheet of that same pattern and create it. I could do it with square angles instead of edging corners and it would be even simpler to create and look factory since not much is rounded but more straight edged. 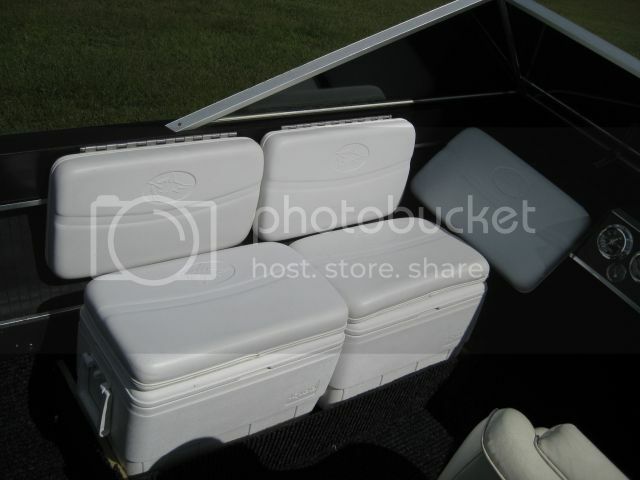 IF thats the case, then I'd just go ahead and buy 2 large coolers, get 2 seats made and velcro them to the top of the coolers. 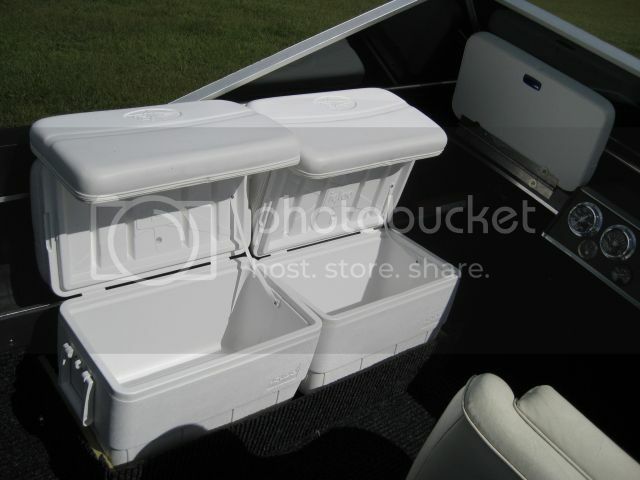 Could of Yellow or white coolers would look nice and tidy too and be removable. Sorry fo rthe duplicate posts...for some reason its not letting me delete them either...ARG! Bill K over at WW shopped me a pic and I gotta admit as he said Could be nice & improve the value if it's done right. I also should be able to use the front pedestal mount for front bracing. that looks really good. if i get the boat that ive been looking at, i want to do the same thing to give it more of a wakeboard boat feel and more seating. I would just build some wood boxes with hinged tops. Wrap then with matching carpet. Cover some cussions and attach on top. That way it would look built in, but would not be permanent. Seems like it would be pretty cheap as well. Not sure how you would address the molded in cup holders and still leave it as is. You may could just get creative with the seat backs. Lfwakeboarddiva, I think it looks really good too. I just made some calls to see about pricing on the vinyl for it and the middle seat, maybe just put another "middle" seat in on the side, have to check dimensions and have to see what all it will require and how much vinyl...but if the vinyl is sewn in that pattern already (which it sounds like it is) I could put mu cushioning under and staple it to the seat back and make it look completely factory..that would be so nice and save the money from an upholsterer. Nooga, I thought about doing that, but I think im ok for the permanent look if it could look like that picture lol...as far as the molded cupholders, it could meet almost to it, or almost one side on the outside with the wood slatted to fit the trim and cupholder part into a groove if that makes sense..
unfortunatly if i do get the boat im looking at, its a 1990 so i doubt that there will be any vinyl sewn already to buy. but my mom is very good at sewing and she had made all types of seat covers for my quad and gokart. so i think she could handle that. LFWakeboarddiva, I will post pics up of the thoughts, process to undertake this and how its going to ram up. Just got a quote from Tahoe and its about 300 for the vinyl for the rear deck, which I could cut and turn how I needed for the sides. OR, somebody on the other side posted pics of another boat and I am kinda leaning this way too, and it would be easier to make and extremely portable if needed. Wheels are turning, just gotta make sure I know what route to take before moving too fast. why not just build the removable seat, pull out your captains chair.. and boom.. construction done.. no boat modifications requried and it can even go back to stock. That is what I was trying to suggest, only if done correctly it would look stock and built in. Even more so than the above picture of the bench seat. Build the lower frame for the seat to fit snugly against the rear seat and passenger cockpit area. Wrap it in whatever your back seat has at its base. Once you put the cushion on it will look built in, yet really just be sitting there. i'd love to do something like that to my four winns 180! Keep us updated on how it turns out and total costs. might start looking into it myself. GOOD LUCK! Well, I think you've discovered that this is very doable. But, I would suggest at the least using your pedestal mount to secure it, but you should really have it secured. From personal experience, it is not safe to ride around on unsecured seats. I would also turn away from hinging the tops. You never know how the fit will be once you get the cushions and vinyl on, plus it just makes it that much easier to tear up. Just having alignment tabs will work fine, plus you can remove them off the water to dry out. Unless you don't mind one bag being exposed, another bench on the other side would help to balance the weight assuming you have a full boat, and fewer seats on the port side. I think the cup holders will end up being a plus. I'm sure you've seen the Wakesetters with the cutouts in the seats for speakers. A simple dip where the cup holders are will keep the same lines inside your boat and make the project look even more stock. Good luck when it gets back on the front burner. I've decided I'm going to start being more gangster, guys. Did you ever end up doing this? duckseatfree, we ended up trading the boat in November. The new boat now has wrap around seating factory . We now have a 2010 Axis A22. We love it and are very glad we upgraded. Sorry I cant be of more help with this project. Well, this thread inspired me to lose the passenger seat and try the bench option. I've gained space and can now seat an extra person. I'll need to have the actual seating surface done by an upholsterer so it matches but heres what I've got so far. That looks good!! Is that bench removeable like in the discussion earlier? The OP was saying that he wanted to be able to hide his ballast bags in the bench, is that the plan? The bench base is fixed but the top comes off for storage inside. Used the boat the last few days, works great. happy I did it. Nice, how wide did you make the seat? I've been thinking about doing something similar in mine, or yanking the entire back seat and making a new wrap around bench. EriCCire, those are cool seats. is that your boat? did you build that base yourself and just set the coolers into the base?